The lobby of the enVision Hotel Boston-Everett, which includes a check-in desk made of vintage steamer trunks. The casino era in Everett took another step forward when Mayor Carlo DeMaria and other local officials helped celebrate the first hotel to open in the city in more than 70 years. The 101-room enVision Hotel Boston-Everett is located at 1834 Revere Beach Parkway, about 2 miles from the future Wynn Boston Harbor casino. Wynn officials have said the casino and its 671-room hotel is on track to open by mid-2019. 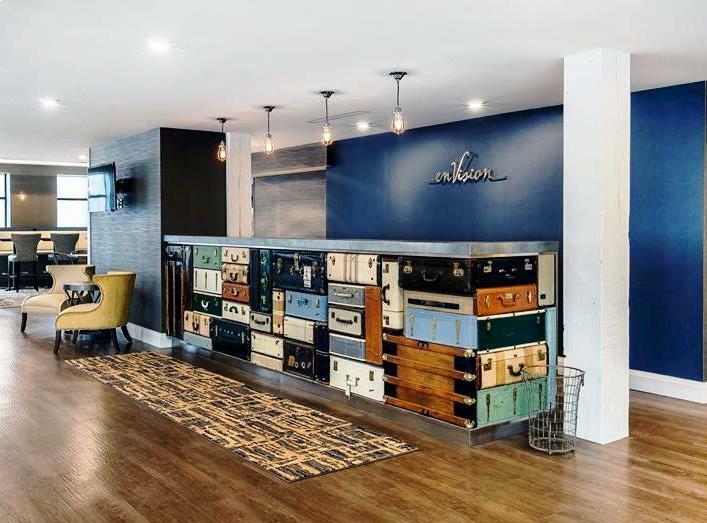 Needham-based Global Vision Hotels developed a 95-year-old building that was formerly a shoe factory, a sewing factory, and more recently retail space. The project included design details that recall the history of the building and the neighborhood. The lobby displays a desk made of vintage steamer trunks and antique sewing machines. The four-story, 54,000 square foot hotel features a cafe and lounge, a small conference room, and a fitness center. Global Vision Hotels operates 10 hotels, seven in Massachusetts. The construction of the Everett hotel marks the expansion of the firm’s EnVision Hotel line, which it began on South Huntington Avenue in 2012. Both are included in the Ascend Hotel Collection by Choice Hotels, an upscale portfolio of unique and distinct hotels and resorts.